GM-PSA product tie-up: How will it work? Future generations of the Peugeot 208, shown, and the Chevrolet Spark could share platforms. It's easy to see how General Motors and PSA/Peugeot-Citroen can save money on shared purchasing of parts, but it is less clear how and when their new-model strategies will come together. The alliance will help GM slash the number of its global vehicle platforms from 30 in 2010 to 14 in 2018 -- a goal the company set last year. But it will be several years before the partners can align their model offerings. And it is uncertain how the partnership will affect GM's global small-car development center in South Korea, since small-car expertise -- along with diesel technology -- is a key area of know-how PSA brings to the alliance. Also, both sides offer hybrid technology. The partners said last month that they will introduce jointly developed "low-emission vehicles" in 2016. But neither has described the vehicles or the segment they will enter. "We look at sharing common platforms," GM CEO Dan Akerson told Fortune magazine in an interview last week. "We're better in certain segments than they are. They want to move into those segments. They're better in smaller cars and maybe diesels than we are." The Chevrolet Spark, Opel Corsa and other small GM models developed at GM Korea could share a platform with the next-generation Peugeot 208 and Citroen C3. But both companies are ready to bring out new models in those segments. 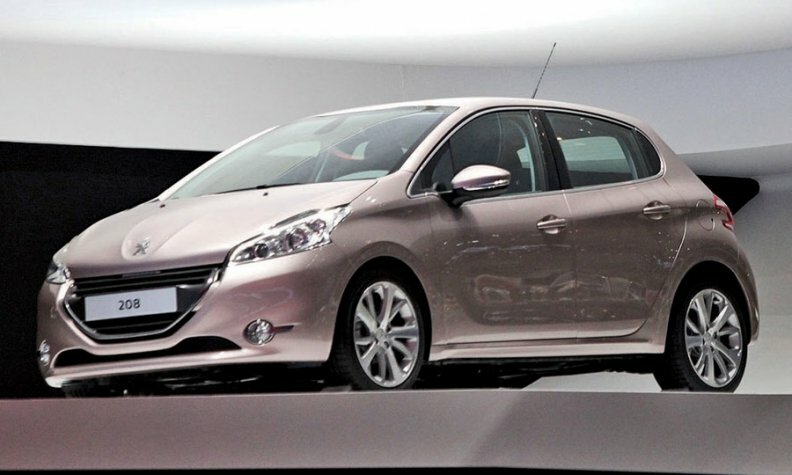 A redesigned Peugeot 208 goes on sale next month and the redesigned Corsa hits showrooms in 2014 on a platform engineered by GM Korea. PSA is not expected to replace the 208 before 2018 or 2019, and GM likely won't replace the Corsa before 2019 or 2020.
Who'll do the B platform? So where will GM's next global B-segment cars, or minicars, come from? "They're going to have to decide whether to base it on the Korean platform, which may be cheaper than anything developed in Europe, or do something with PSA's platform," said Max Warburton, senior analyst at Bernstein Research in London. GM Korea is working on the next-generation B platform, though GM's small-car development could conceivably shift to PSA because of the need for high-tech solutions for Europe's stiff emissions requirements. The European Union plans to impose tougher fleet CO2 emissions limits of 95 grams per kilometer by 2020, equivalent to 3.9 liters of fuel consumption per 100 km or 60.9 U.S. mpg. That's a big jump from 130g/km (5.3 l/100km; 44.5 U.S. mpg) that will be imposed by 2015. But such high-tech, lightweight B-platform cars won't be required in China, Korea and Latin America, so GM Korea likely would continue to lead B-architecture development for global markets. Still, the B-platform technology required in Europe may be too costly to sell in Europe only. And adding PSA volume to GM's global B-segment platform would increase the number of vehicles using the architecture to an estimated 2.7 million units -- a scale that only Hyundai-Kia has in the segment. Said a GM spokesman: "We would not take any actions that compromise the success of our Korean operations. We are in the process of operationalizing the alliance with PSA and no decisions have been made yet." Battery-power and range-extender technologies are expected to be used for the "low-emission vehicles" due in 2016, says Ian Fletcher, a senior analyst at IHS Automotive. But will it be PSA or GM technology? GM offers the Chevrolet Volt plug-in hybrid, while Peugeot sells a diesel hybrid, the 3008 HYbrid4, which uses a diesel engine to drive the front wheels and an electric motor for the rear wheels. GMC Acadia, Opel Insignia, Buick LaCrosse and other GM models. Cooperation on mid-sized vehicles might come before B-segment models because Opel and PSA lack scale. In Europe, last year VW sold about 246,000 Passats, while PSA sold 147,000 units of the Citroen C5 and Peugeot 508 and Opel/Vauxhall sold 140,000 Insignias. The next mid-sized car from PSA is expected to be the replacement for the Citroen C5 around 2015. GM has re-engineered the mid-sized Epsilon platform to create longer, wider vehicles. For example, the platform covers vehicles ranging from the mid-sized 2013 Malibu to the full-sized 2013 Cadillac XTS, which goes on sale in May. The Opel Insignia is based on the previous Epsilon generation. Sedans, crossovers and SUVs are planned under the alliance for the B and D segments. Diesel is another opportunity for cooperation. GM is well-positioned in small diesels in Europe, with 1.3- and 2.0-liter technology co-owned with former partner Fiat. But in the mid-sized diesel segment, which is becoming the dominant engine size in Europe, GM still uses an updated version of an aging Isuzu 1.7-liter. PSA, which co-produces diesels with Ford, has a more modern 1.6-liter. "People criticized GM-Fiat but despite cultural differences they achieved a lot in powertrain," Warburton said. "PSA and GM will find some savings. It will take time and there will be fights, but they'll surely find some. Something is better than nothing."